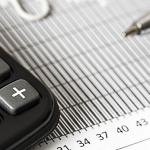 When you’re new to exhibiting especially, choosing the right display style for your budget can be a time consuming challenge. 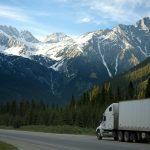 To help get you started off right, we have collected some of our most popular show display booths that combine many common needs our customers have. Your all-star event is red carpet ready with our 10ft Waveline Straight floor display system. This perfect ‘step and repeat’ backdrop combines elegance with ease, utilizing the slip on “pillow case” design of our Tubozip backdrop display. The high profile branding graphics are mounted with an industrial zipper onto a no fuss frame, easily assembled by 1-2 people. Top quality dye sublimated printing on Polyester for a tight, virtually wrinkle free stretch fabric that dissipates camera flash to avoid photography glare. This ideal step and repeat backdrop features competitive pricing with professional impact, benefiting from a compact quick fold out accordion design. 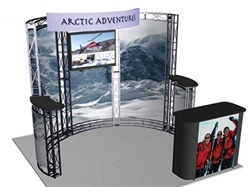 Make your attendees feel like celebrities with an exhibition booth built ready to promotion your brand. 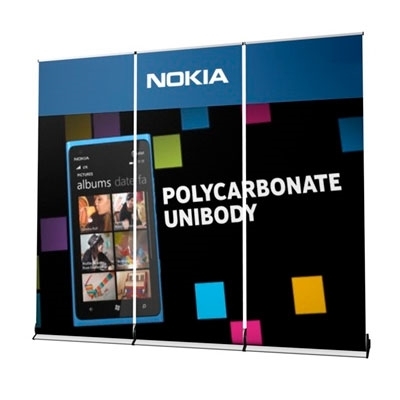 The 8ft Straight Floor Tension Fabric Pop Up system combines the popular convenience of a banner stand with the impact of a pop up display wall. This floor trade show booth is portable and effortless to setup with the entire display collapsing into a durable carry bag with casters. ® ROLLO retractable banner stands offer an outstanding combination of durable construction, lightweight design, and value pricing. 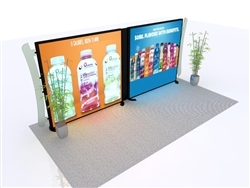 They are the perfect display solution for trade shows, point of purchase, sales campaigns, recruiting, or any other advertising venue. Use individually or side by side as a dynamic back wall. 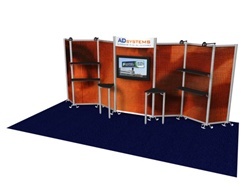 Our fabric pop up combines the convenience of a banner stand with the impact of a pop up display wall. 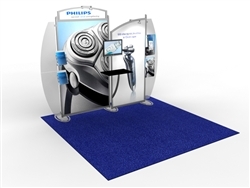 This curved floor trade show booth is portable and effortless to setup. The entire display collapses into a durable bag with wheels. Your all-star event is red carpet ready with our 10ft Straight Floor Tension Fabric Pop Up system. This perfect ‘step and repeat’ backdrop combines elegance with ease, benefiting from a fold out accordion design. 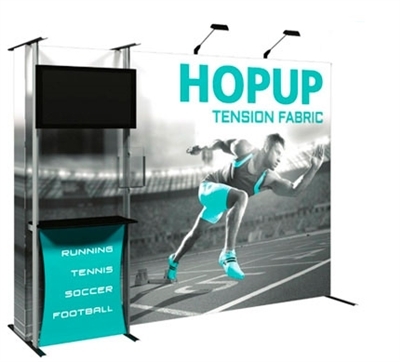 Our fabric pop up combines the convenience of a banner stand with the impact of a pop up display wall. 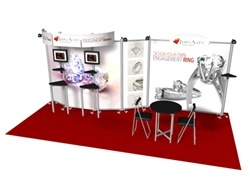 This tabletop trade show booth is portable and effortless to setup. The entire display collapses into a durable bag with casters made from 100% recycled materials. ENERGY is the strongest and most versatile pop up system on the market, with unique features that set you apart from the crowd. A unique modular design allows you freedom to create custom looks and sizes with the ability to expand both vertically and horizontally. Create the perfect exhibit by adding accessories, including backlit panels, custom cutouts, monitor mounts, shelves, and lighting. Energys incredible heavy duty load bearing system can support up to 500 pounds of weight. Fabric or graphic panels attach easily with magnetic strips to give a seamless professional look in no time. Our complete kits include halogen lights, deluxe hard case with wheels, and fabric or graphic case to counter kits. Lifetime frame warranty. Our Satellite modular fabric tension back wall kits include aluminum tubing, fabric structure with fittings, frosted plexi-glass header, toolkit, and locks. 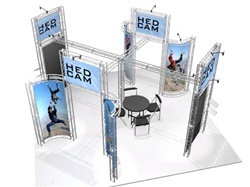 Dress your booth area up with vibrant full color graphics supported with a modern lightweight portable structure. Satellite is available in several designs and sizes. Add a full color counter graphic to complete your display area. Each booth is portable and effortless to setup. Optional lights, hard cases, and monitor mounts available upon request. Showcase your brand in style and save with this amazing bundle. 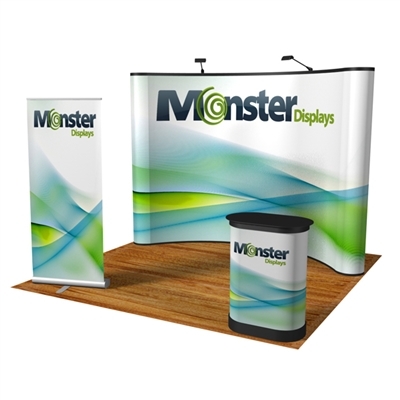 You have everything you need for a successful event in this kit: an eye-catching ten foot photo-mural popup display, elegant wood flooring, a functional podium and a banner to showcase your specials. All for an exclusive low price! This kit is an upgrade to the traditional tension fabric popup display, accessorized with a large monitor mount, a functional counter, and literature holder. Accessory mount elements can be placed in the middle, left or right sides of the display. The Hopup Dimension Kit 3 is a stylish and functional 10’ straight wall setup. You can’t beat the speed and effectiveness of the Hop up design’s “expandable frame” where the display with attached graphic is able to set up in thirty seconds. Just expand the frame and you are ready for the show! ENERGY is the strongest and most versatile pop up system on the market, with unique features that set you apart from the crowd. A unique modular design allows you freedom to create custom looks and sizes with the ability to expand both vertically and horizontally. Create the perfect exhibit by adding accessories, including backlit panels, custom cutouts, monitor mounts, shelves, and lighting. Energys incredible heavy duty load bearing system can support up to 500 pounds of weight. Fabric or graphic panels attach easily with magnetic strips to give a seamless professional look in no time. Our complete kits include halogen lights, deluxe hard case with wheels, and fabric or graphic case to counter kits. An affordable, upscale series known for its attractive curved design and versatile panels that allow for fabric or direct print graphics. Both a 10 ft. and 20 ft. expanded model are available, boasting a lightweight yet durable design. Despite the modular potential, the display setups quickly using a knob-assisted proprietary assembly typically completed in 45 minutes. Proudly made in the USA and offering options that include workstations, pedestals, headers, literature holders, iPad accessories, and monitors. Keep your display safe on the go with a hard roto-molded carrying case. The innovative SuperNova™ LED Inline lightboxes combine exceptionally bright LED lights, modular engineered, an aluminum frame, and silicone edge fabric graphics into a brilliant eye-catching display. The SuperNova LED lights are attached to the frame which makes assembly easy and packaging a snap. 10 ft. and 20 ft. versions are available, in both one-sided and two-sided lightboxes. All have integrated cord management. The eSmart Inline Displays are design-driven, reconfigurable, and user-friendly. Using the most sustainable materials on the market, these displays prove that you don’t need to look green to be green, and you don’t need to spend more either. You’ll always get the best of both with an eSmart. 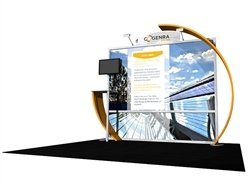 ECO-1009 Trade Show Display – With endless accessory options, low price points, and free design services, look no further than the eSmart display line. Visionary Designs are neither built from molds nor pulled from some shelf. They are custom modular displays in the true sense of the term. For some, they are designs fully formed and fully realized requiring only your distinctive graphic vision. 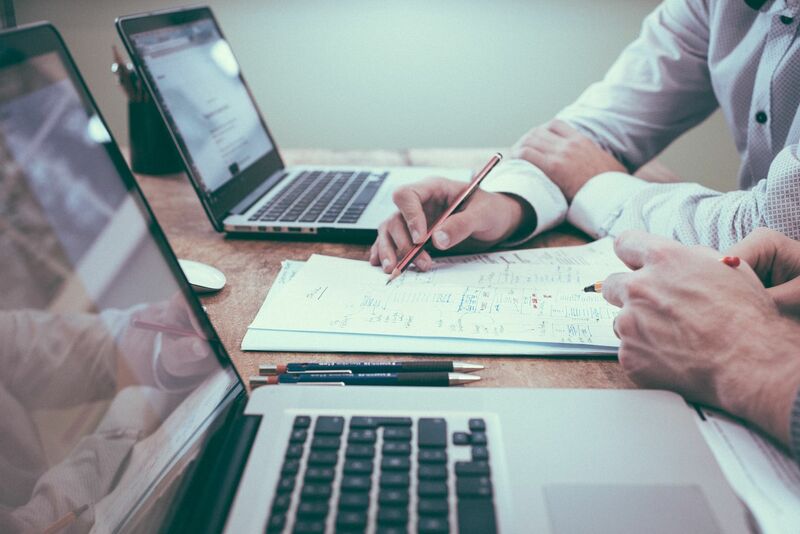 For others, they are starting points where you can combine ideas to create a vision as identifiable as your company. With Visionary Designs you can achieve whatever you want – no limitations, but at a price thousands of dollars less than a custom exhibit. The innovative SuperNova™ LED Inline lightboxes combine exceptionally bright LED lights, modular engineered, an aluminum frame, and silicone edge fabric graphics into a brilliant eye-catching display. The SuperNova LED lights are attached to the frame which makes assembly easy and packaging a snap. 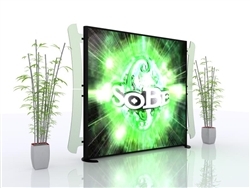 20 ft. and 10 ft. versions are available, in both one-sided and two-sided lightboxes. All have integrated cord management. VK-2940 SuperNova Inline Lightbox – The lightboxes use SuperNova LED lights, ensuring an exceptionally bright graphic and thousands of hours of worry-free use. We hope you enjoyed this one stop dashboard view of different displays for your budget range.